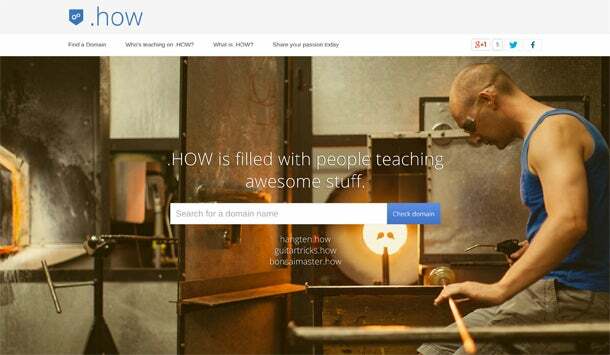 Google today released a new generic top-level domain (gTLD) ending to the world. It’s simply .how. The search giant’s aim in offering the newest URL extension in the growing Google Registry is simple: To offer businesses and individuals a more direct, interesting way to share content that teaches people how to do something. Businesses that provide advice, products or services that help people acquire knowledge or skills -- such as a children’s robotics camp or an at-home beer-brewing supply and recipe provider -- are well-suited for a .how URL extension, Google says. As part of a pilot program, Fried said several people and companies are already using .how, including the pro skydivers behind skydiving.how, the sword technique instructors who launched swordclass.how and several other education-focused online destinations. Anyone can apply for a .how URL extension through Google at www.get.how. There’s no screening or content approval process involved. If your suggested .how website name is available, Google will direct you to one of its many domain name provider partners, like name.com or domainsatcost.ca. The cost to secure a .how web address ending depends on which Google domain name partner you choose. Prices start around $28 annually on some of the partner sites. In 2008, the Internet Corporation for Assigned Names and Numbers (ICANN), the nonprofit that oversees Internet domain names, announced that it would issue more than 1,300 new gTLDs. The addition of .how is Google’s third top-level domain release, coming on the heels of company’s debut of .minna (which roughly translates to “everybody” in Japanese) last February, and .soy last October. Want to Be a Better Entrepreneur? You Don't Have to Look Far.